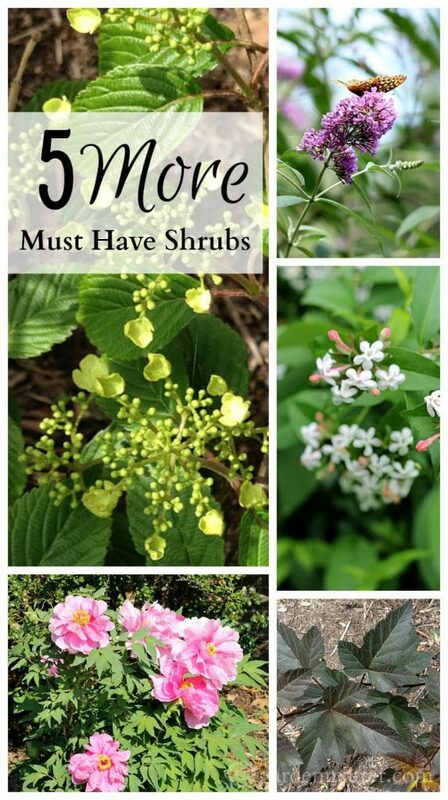 5 more must have shrubs for your garden is a follow up of the popular 5 must have shrubs for your garden post, describing multiple interest plants for a beautiful garden. 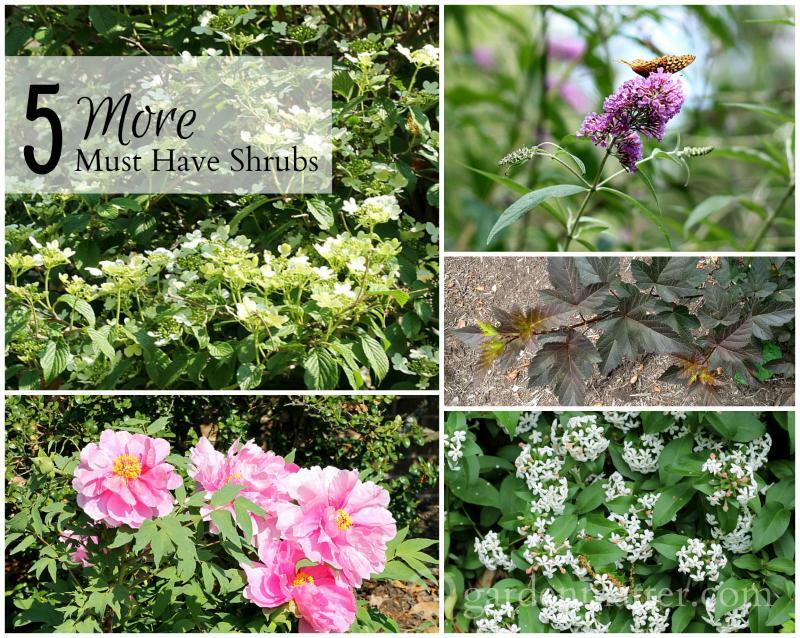 One of my most popular posts is 5 Must Have Shrubs for Your Garden. That was back in 2014 and while I’m thinking of this year’s garden, I thought I’d share 5 more must have shrubs. They are all easy to grow, require little maintenance and are deer resistant. Again, I’m giving you the basics, along with a couple of images, and my reasons for loving them. Has a very full and bushy arching cottage garden growing style. Very low maintenance though it needs to be pruned in late winter or early spring, as it blooms on new wood. It’s a show stopping bloomer, which certainly attracts butterflies and keeps blooming all summer long. Another arching, cottage garden feel style. A super fast grower, you can, and should prune it down to 6-8 inches in early spring. It will produce tons of flowers and grow to maturity very quickly. Mainly I like it for its striking dark-colored foliage. It’s a big full shrub that looks great in the landscape. White flowers bloom all summer long followed by pretty berry clusters. Super low maintenance and adapts well to being pruned. Sturdy habit, stays upright after storms, unlike traditional peonies. Survives even the harshest winters. Shrubs are an area I need to work on. We had an Abelia grandiflora in the yard of a previous home. I never knew what it was, but loved the beautiful fragrance! And the butterfly bush is a favorite – I need to add one this year. 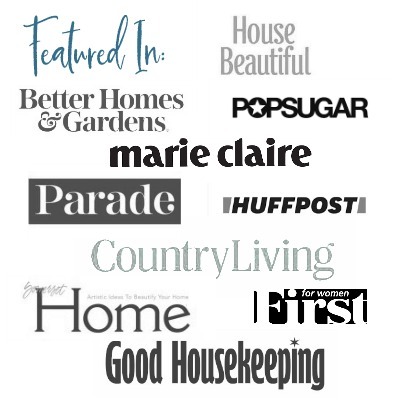 Thank you for a good list to get going with. I know sometimes buying a shrub can be a big deal. They can be really large and more difficult to plant. Some are pretty expensive, but well worth it in the end. Here’s something you may already know, but sometimes I seed butterfly bush seedlings at the nursery for a few dollars and they will grow to a nice size bush in one season. Quite the bargain. I agree with Carole – the tree peony is beautiful and I’d like to have it. However, our summer temperatures have risen dramatically (over 102 degrees for most of the summer). My garden is in full sun and the heat killed many plants. Do you have any recommendations for heat tolerant plants, shrubs, and trees? I live in eastern Washington zone 7. Wow, 102 is awfully warm. It that keeps up they’ll have to change your zone. Really, all of these shrubs are supposed to be hardy to your zone. We’ve had some hot spells and all of these shrubs have done well. One other I would include for you that I cannot easily grow here is the crepe myrtle. I love the tree peony – will have to look into this when we move. Trying to scale things back and just focus on spring planting for now, we’re off to look at land today which is always exciting. Great information, thank you! Tree peonies are great. You will love them. They bloom very early but the shrub stays nice all season. Good luck with the move. Sounds very exciting! !